Starring: Vincent Cassel, Gerard Depardieu, Cecile De France, Gilles Lellouche, Roy Dupuis, Elena Anaya. The allure of the gangster lifestyle seems to be a constant source of entertainment for people (myself included). It’s a genre that has turned out countless classics and with this recent French addition, director Jean-Francois Richet has a good go of including his film amongst the best. 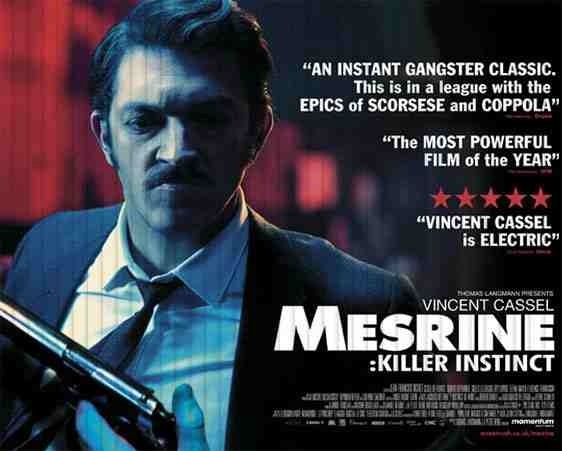 Part one “Killer Instinct”, covers the early career (1959 – ’70) of outlaw Jacques Mesrine (Vincent Cassel), covering his military service in Algeria, apprenticeship with a Paris gang-lord (Gerard Depardieu), crime-spree partnership with soulmate Jeanne (Cecile De France) and escape from a tough Canadian prison. Being only the first installment of this two-part, 4 hour crime flick. The word ‘epic’ may spring to mind. Strangely though, it never felt epic to me and I think this was mainly down to it not being about a criminal family but only one individual. 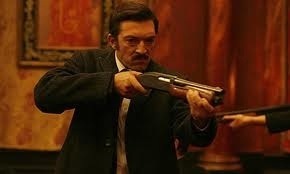 However, it’s no less effective and has more in common with “Scarface” in Mesrine’s one man rise to power or notoriety and “Bonnie & Clyde” for his crime spree with a ladyfriend. What’s demanded from it, is also the thing that holds it all together and that’s a lead performance of power and charisma. This is where Vincent Cassel comes in. He’s absolutely captivating. He commands every bit of the screen with a tour de force show. Being one of the finest actors around at present Cassel can now officially change his name to ‘excel’ for his portrayal of this dangerous career criminal. Excellent support also from a sadly underused but menacing Gerard Depardieu, who shows great presence and the only one that comes close to Cassel’s powerhouse performance. An exciting fast paced bio-pic that’ll have you hooked right from the excellent split-frame opening scene. Worth checking out for Cassel alone. This entry was posted on January 12, 2012 at 3:19 pm and is filed under Crime, Drama, Foreign Language with tags 2008. You can follow any responses to this entry through the RSS 2.0 feed. You can leave a response, or trackback from your own site. I recorded this on television the other day, after reading this review I know I need to see it. Great flick, Vinnie. If you can watch both parts back-to-back, go for it. It’s superb stuff. The second part is on this week actually. Thanks for the advice, they both look like great movies. Great to hear, Vinnie. I look forward to your take on them.